Samsung has unveiled its third smartphone in the Galaxy A series at the Consumer Electronics Show (CES) in Las Vegas, Nevada. Featuring a bold 5.5-inch Super AMOLED display, the Galaxy A7 is bigger than both the Galaxy A5 and A6. However, don’t let that fool you into thinking it’s uncomfortable to hold or use. With a thickness of just 6.3 mm, the Galaxy A7 is the slimmest smartphone in Samsung’s A series. It’s important to note that Samsung is offering two different versions of the Galaxy A7: a single SIM variant and a dual-SIM variant. The single-SIM Galaxy A7 will feature a 32-bit Exynos 5430 chipset, which actually uses four Cortex A15 cores and four Cortex A7 cores (making it an octa-core processor), while the dual-SIM version features the 64-bit Snapdragon 615 SoC, which also uses eight cores. Regarding the performance of these octa-core processors, it’s still early to make any definitive statements. However, experts say both variants of the Galaxy A7 will deliver impressive speeds. Dual-SIM smartphones have become a hot commodity in recent years, as more and more people need both a personal and business line. With compatible smartphones like the new Samsung Galaxy A7, users can setup their device to use two separate phone numbers. This eliminates the need for individuals to carry around two smartphones, as dual-SIM devices can send and receive calls from both lines. Other specs for the Samsung Galaxy A7 include 2GB RAM, 16GB storage, 13-megapixel primary camera, 8-megapixel secondary camera, 2,600 mAh battery, and it will Android 5.0 Lollipop — the latest version of Google’s Android operating system. 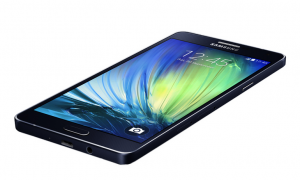 In addition to the Android OS, the Galaxy A7 will also run Samsung’s signature TouchWiz UI. According to ZDNet, the Galaxy A7 will feature LTE Category 4 to deliver download speeds of up to 150Mbps and uploads of 50Mbps. It’s unclear which carriers will offer these download speeds at this time. So, how much will the Galaxy A7 cost? Reports indicate that retailers in China are selling it for 2,599 yuan, which is about $424 USD. Considering the high-end specs it features, that’s a pretty good price. The Samsung Galaxy Note 4, for instance, is priced at $870 without a contract, making it over twice as expensive as the South Korean electronic company’s latest Galaxy A series smartphone. What do you think of the Samsung Galaxy A7? Let us know in the comments section below!